A rich culture, Hungary has lots of fun traditions and decor ideas to try for an ethnic Christmas celebration that is colorful and delicious. Discover Hungarian foods and heritage. "Kellemes Karacsunji Unnepeket" (Abundant Christmas Holidays), "Boldog Karacsonj" (Merry Christmas) in Magyar, and candy for Christmas is "szalon cukor". You can decorate your tree in festive Hungarian style and include some of the wonderful baked goods that Hungary is famous for! Cleveland Hungarian Heritage Museum has delightful Christmas pages from which I found the interesting information on Hungarian Honey Hearts. Paper cornucopias, or wrapped as little rolls,filled with homemade fudge (Szalon Cukor) hung from the branches. Advent wreaths are commonly used to start off the advent season, with candles are that are decorated with red and gold ribbons (symbols of life and brightness). Children get Advent calendars, and these are always a fun way to celebrate the days leading up to Christmas. The Hungarian Christmas celebration begins on Christmas Eve, and the tree is decorated on Christmas Eve, not before, with the presents put under it at that time. This is related to the fabrication that angels deliver the tree and presents...not unlike our Santa stories, but with the lovely thought that all come from Christ. Children enter the room with the tree after they hear little bells ring and Christmas music- telling them all is ready. The family gathers around the beautiful lighted tree and say a prayer. Then gifts are distributed and everyone enjoys opening their presents. oven heated to 325º F.
- Cook the rice according to instructions and set aside. - Rinse the sauerkraut 1-2 times and squeeze out the water. - Sauté / brown sauerkraut with a little oil (1 TBSP) until tender; set aside. - Chop the onion and brown with the ground pork. When almost done, add the paprika and on very low heat simmer for about 10 more minutes. - Cut the smoked sausage into rings. - Place half of the sauerkraut on the bottom of the casserole dish. Layer with meat, rice and ½ of the sour cream mixed with 4-5 TBSP of milk, followed by the other half of the sauerkraut. - Bake in preheated oven for about 35-40 minutes. Sift together the flour, sugar, cinnamon, cloves and baking soda. Melt together the butter and the honey, pour over the flour combination and stir to mix. Add 1 egg and knead together. The dough should be soft (you can add a bit of lukewarm water if necessary), since it will harden a bit during its resting period. Cover the dough in a bowl and let it rest at least one day at room temperature. Rolling out the dough is easiest between two pieces of waxed paper. Cut desired shapes out of the dough (of about 3/8 in. thickness on average). Place cut out pieces of dough on a cold, greased cookie sheet, bake at 350° F. (or less) for about 6-8 minutes. Thicker pieces may need a longer time (ovens temperatures also vary). DECORATION: Before baking, brush with the yolk of an egg to which a few drops of red food coloring have been added. If you are decorating with seeds, brush dough with egg white to "paste" seeds on top of dough before baking. Alternately, let the honey cakes rest a few days and then decorate with colored sugar icings. Spoon this mixture into a small nylon baggie, cut a tiny hole in one corner, roll up and use like a pencil to draw and color. 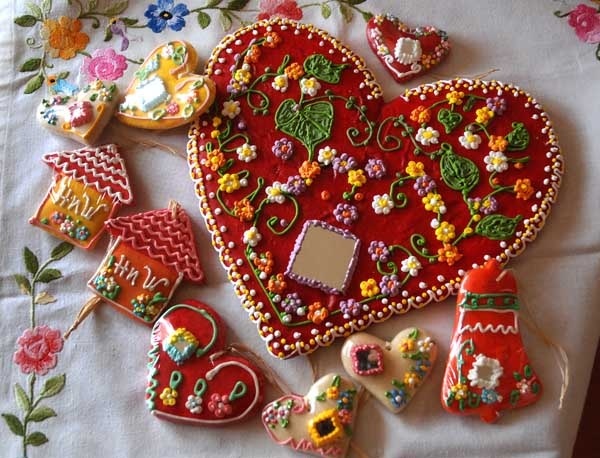 If you wish to see much more on Hungarian Christmas traditions, the home page for this information is The Christmas in Hungary page of the Hungarian Heritage Museum, online. 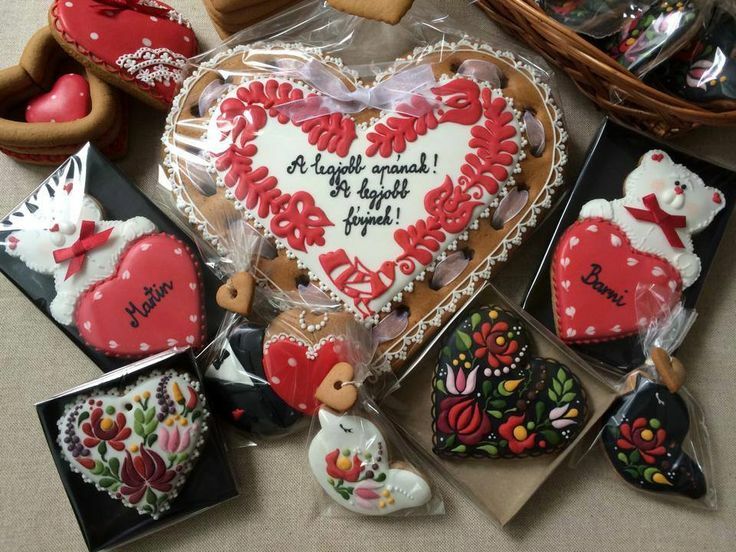 "Hungarian honey hearts were originally a specialty of the city of Debrecen. sweetheart looks into the mirror, she is "seeing herself" in his heart."